Counting books are a dime a dozen, with good reason. When kids are learning their numbers (usually around age 3 or 4), repetition helps a lot, and books are a fun way to add a bit of story and some visual appeal. Even before kids are ready to count themselves, counting books help young children understand math concepts. Interestingly, research shows that toddlers as young as 18 months have some sense of numeracy. 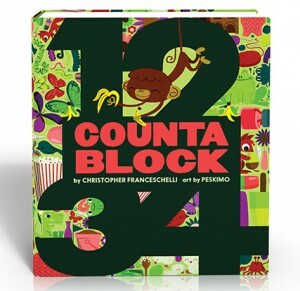 One recent addition to this rich genre is Christopher Franceschelli and Peskimo’s Counta Block. The first thing that struck me when I received a review copy from the publisher is the thickness of the book. 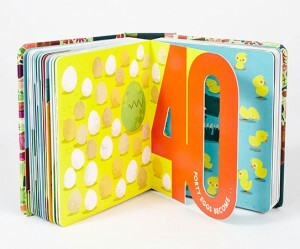 All board books are thick, but this one is extra thick. The reason: it goes well beyond 10, teaching numbers all the way to 100. The illustrations are super-cute, and I found myself engaged by this book, even though my number-learning days (and those of my kiddo) are long in the past. This vegan-friendly number book would make a welcome addition to any bookshelf. Count me among its fans! Thanks for this review. I love that it goes to 100. My daughter struggled with number recognition for larger numbers because we never saw them to reinforce them. A book that goes past 10 is really helpful.